Hawks are going to the State Championship! 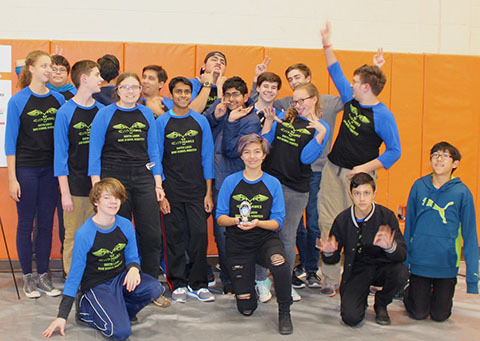 On November 11th the South Lakes robotics team traveled to Orange County High School in Orange, Virginia. With a rocky start, we continued through our matches assessing problems we encountered out on the field. However, after a fantastic judging panel, we had many judges stop by our colorful pit table to interview us further. We received a lot of praise for our engineering notebook as well! We passed out handy-dandy handout cards to fellow team competitors that list our robots capabilities. when they came to our table during scouting. In turn they gave us knick-knacks when we came by to scout them. During the award ceremony, we were named first place for the Connect Award for our extensive outreach. We were also awarded second place for the Think Award for our Engineering Notebook. Last but certainly not least, we were named 3rd place for the Inspire Award! The inspire award allows us to advance to the States Championship in Richmond! After the competition, the team had a celebratory dinner at a barbecue restaurant. The team members talked about events from the competition, as well as plans for the Battlefield competition as extra practice before states. This entry was posted in Uncategorized by kaithompson23. Bookmark the permalink.